These were not young men. They were easily middle aged, but were giggling like teenagers. For this trip we didn’t organize data for our phones and since we didn’t have access to wifi during the day, we didn’t keep up with the scores of the Premier League matches that happened earlier in the day. On the train, my husband overheard some people talking about some of the results. We heard about the incident in the Chelsea game where Chelsea manager Jose Mourinho had been red-carded at half time because of his behavior toward the officials. Jose has been coming apart for a few weeks now. It isn’t unimaginable that he might have a nap on a crowded train somewhere in North London. But the kid was right. That wasn’t Jose. We exited at the Holloway stop rather than the Arsenal stop because we hoped to visit the Tollington Arms, which had been recommended by a friend as a place for excellent atmosphere in advance of the game. It was packed beyond all possible capacity with Arsenal fans. Every square inch of the interior and exterior yard was full of fans, dressed in Arsenal scarves, jackets, shirts. We stopped by another pub. Same situation, but they didn’t have a yard. Even the McDonald’s was packed with Arsenal fans. We stopped at Costa instead. My husband had hot chocolate. I had a flat white. I’m not sure I’ve ever seen a coffee shop that crowded. My husband mentioned that he’d read that the late Saturday start that traditionally occurred for one match, as decided by the British TV outlets, was tricky for the clubs because the fans had all day to drink. It is my testimony that most of the ones I saw had clearly availed themselves of this opportunity. In addition to the guys we saw on the train, we saw much boisterous behavior on the way into the stadium. There was positive and negative to the well-lubricated crowd. On the negative front, we saw some loud arguments that appeared close to blows. On the positive side, the crowd was as engaged and much louder than it had ever been on one of our visits. The variety and volume of songs by the crowd was substantial. We heard many songs we’d never heard before, and some with lyrics we couldn’t make out. Yes, probably for the best. Some people started this one song, and the guy behind me shouted’ “I hate this song!” But before long, he, too, was singing it at top voice with all the others. The game was very exciting, more exciting than it needed to be, actually. Because the match against Bayern Munich was so recent, some players needed to be rested (and a couple were injured or ill), so it maybe wasn’t the very best 11 players to start the match. 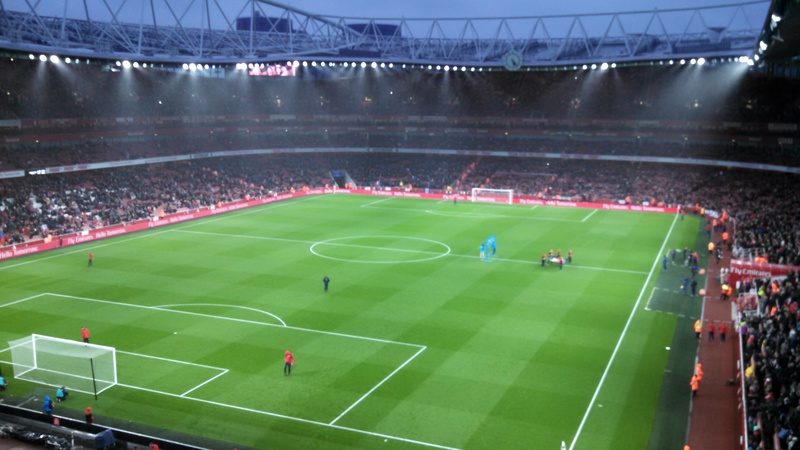 Still, Arsenal played quite well even if not at top sharpness. Olivier Giroud got the first goal, a ball that skimmed the top of his head just enough to alter the direction so that Everton goalkeeper, Tim Howard, couldn’t get to it. Giroud had been in a good position to block Howard’s view, so the keeper didn’t get much of a look at it before it was in the net. The second one came from a free kick by Santi Cazorla due to a foul on Alexis Sanchez where Howard made a bad decision and Koscielny headed it in. It’s been a while since he had a goal, so that was exciting. Arsenal let Everton back in with a shot deflected off Gabriel’s leg that Petr Cech couldn’t get to. The first half ended at 2-1. There were no goals in the second half, but plenty of excitement and plenty of chances for both sides. Arsenal managed to hold on to the win, and the 3 points put us in first place in the Premier League for the first time this season. Manchester City has a game today against Manchester United, so has a chance to go back on top. Once again, we waited for the final whistle and then ran out to the Arsenal station, loading into the train cheek to jowl. It was warm on the train and suddenly I felt absolutely exhausted. We relaxed a little at the hotel and used Facebook Messenger to check in with the kids. There was a pub called The Crosse Keys next to our hotel and we went in for a quick beer and dinner. My meal was completely forgettable, but my husband had the best fish and chips I’ve ever tasted other than the awesome La Fiesta in, of all places, Niagara Falls, Ontario. I haven’t eaten there since I was a kid growing up in the suburbs of Buffalo, and I’ve long since given up on finding any better fish and chips. Lest you think the English ignore their history, the Friday Times had a 600th anniversary pullout section on the battle. My husband had the 10 Acorns. Why? It tasted good. By the time I get off this plane to Chicago, City will probably have retaken the lead in the Premier League. I am hoping for a tie. A tie will still put Man City in first place on goal differential, but it wouldn’t hurt for there to be a little point damage to both teams today. Lots of season left. As I look at the monitor on the seat back in front of me on the plane, we’ve completed the leg over the Atlantic. Still a long way across Canada and the US to go. We had a great trip and watched an exciting game, but I can’t wait to see my kids. Great post. The behind the scenes happenings of a Premier League match were so much fun to read. I liked the detail you provided of your various experiences and it sounds like you had a great time!